'The babies are rising, the younger men are growing, growing to hide all and everything. The nakedness of reality which we see to-day will be hidden in the shade by and by. These brand-new cemeteries, looking often so fresh and rich in their masses of brownstained wood, will pass. They will first be re-set-up in stone. 1921 will see them rolling out in new stone crosses, at first startlingly pallid and virginal, but as the months go on, getting gradually greyened and darkened, rain-washed, wind-blown, then falling a little from the straight. Flowers will bloom as new summers shine o'er the dead. Visitors will come. There will be a greater time of visiting the cemeteries and the battlefields than there yet has been. Gardeners will be conscientious, and then some less conscientious as the years roll by and visitors become less. Most of the cemeteries in the more obscure places will be half-forgotten and gone desolate. 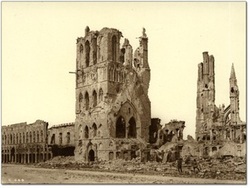 There must come a time when no more visit the burial-places of the great war than visit now the cemeteries in Crimea.' (The Challenge of the Dead). A few months after his return from the battlefields, Stephen was again off on his travels, this time with a plan to travel across Europe to see how the continent was recovering from the trauma of war. He later wrote of his experiences in his book Europe: Quo Vadis? A careful comparison with the diary he kept during his trip shows that Stephen - as he had done when writing about Russia - often took a degree of 'poetic licence' when writing up his travels. He did not invent incidents or claim to have visited places he had never been too, but he did use his published work to impose an order both on his travels and his experiences that did not reflect the sometimes confused reality. 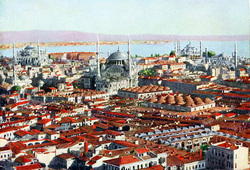 Stephen's trip in the second half of 1921 took him from Italy to Greece and the new state of Yugoslavia. He then travelled north through Bulgaria and Rumania before heading on to Czechoslovakia and Poland. He ended by coming back through Germany and France. Stephen was of course by now well-known as a journalist and he was able to meet many influentia people on his travels (including the President of Czechoslvoakia). He also travelled now by train rather than foot - a practical necessity given the distances he had to cover. His trip did not leave him optimistic. Even three years after the war Europe still faced many problems. The prospect of revolution in at least some countries seemed real. It was perhaps for this reason that when he returned home Stephen once more took refuge in some of the more esoteric ideas that he had once espoused but largely abandoned since his time in the trenches. He wrote an elaborate Credo for the journal The Beacon which began with a rousing declaration that 'The old order of life in the world is dying and a new order of life is rising to take its place. Nothing can stop it. It grows out of the collective human heart and the hidden forces. It is not advanced by thought; it is not brought about by propaganda – it grows. It does not arise from one man’s action or one man’s prominence, but comes of all men'. Stephen also renewed his acquaintanceship with his old friend Dmitrije Mitrinovic who penned abstruse articles about international politics for the journal The New Age. Both men felt that the recent cataclysm had so changed Europe that there simply could be no return to 'business as usual' either in politics or in the lives of ordinary men and women.